Reason for increase (decrease) in net profit for current quarter compared to the same quarter of the previous year Key reason for improvement in Net Profit is due to the higher container volume handled by Ports Segment. Business at water segment has marginally slowed down due to the temporary pipeline damage which led to the suspension of service for several days. Despite higher operating expenses as well as finance charges due to increasing SAIBOR rates, the net profit is still higher due to the better performance of associate companies and cost rationalization in all subsidiaries during the third quarter. Reason for increase (decrease) in net profit for current quarter compared to the previous quarter Key reason for the marginal decrease in Net Profit as compared with the previous quarter was due to decrease in revenue in Logistics and Water segments. Reason for increase (decrease) in net profit for current period compared to the similar period of the previous year Key reasons for decline in Net Profit as compared to same period of last year are as under:- Revenue is lower by about SR 23 million mainly due to decrease in inspection tariff by the port authority. Business activity in logistics segment has also slowed down.- Higher direct costs due to additional depreciation of port expansion completed at the end of 2017 and increase in government levies. Financial charges this year are higher and there was a one-off income of SR 11 million last year. Reclassifications in quarter financial result Financial Statements for the current period have been prepared according to the International Financial Reporting Standards (IFRS) that are endorsed in the Kingdom of Saudi Arabia and based on that the presentation, measurement, recognition and disclosure for some of financial data has been changed to comply with IFRS accounting policies as adopted in the Kingdom. Reasons of increase (decrease) for quarter compared with same quarter last year Key reasons for decline in Net Profit as compared to same quarter of last year are as under:- In same quarter last year, there was a one-off income of SR 11 million- Higher direct costs due to additional depreciation of port expansion assets that are now put in to operation.- Higher finance charges due to increasing SAIBOR rates. Reasons of increase (decrease) for period compared with same period last year Key reasons for decline in Net Profit as compared to same period of last year are as under:- Revenue is lower by about SR 50 million mainly due to lower container volumes handled by port segment. Business activity in logistics segment has also slowed down.- In same period last year, there was a one-off income of SR 11 million- Higher direct costs due to additional depreciation of port expansion assets that are now put in to operation.- Higher finance charges due to increasing SAIBOR rates. Reclassifications in quarterly financial results Financial Statements for the current period have been prepared according to the International Financial Reporting Standards (IFRS) that are endorsed in the Kingdom of Saudi Arabia and based on that the presentation, measurement, recognition and disclosure for some of financial data has been changed to comply with IFRS accounting policies as adopted in the Kingdom. Other notes Total revenue for the current quarter ending 30 June 2018 amounted to 154.0 million riyals compared to 149.2 million riyals for the same quarter last year, a increase of 3.2% and total revenue for the current period ending June 30, 2018 amounted to 272.0 million riyals compared to 321.2 million riyals for the same period last year, a decrease of 15.3%.Earnings per share reduced to SAR 0.15 compared to SAR 0.30 same quarter last year and earning per share for the period is reduced to SAR 0.15 compared to SAR 0.57 same period last year. Total shareholders' equity (after minority interests) as at 30 June 2018 amounted to 1,053 million riyals, compared to 1,060 million riyals for the same period last year, a decrease of 0.7% and with decrease of 1.4% compared to previous quarter due to payment of dividend in Q2-2018. Total Comprehensive income for second quarter amounted to SAR 13.5 million compared to SAR 37.9 million in same quarter of 2017, a decrease of 64.3% and Total Comprehensive income for current period amounted to SAR 12.3 million as compared to SAR 71.5 million in the same period last year, a decrease of 82.8%. Reasons of increase (decrease) for quarter compared with same quarter last year Gross profit is decreased due to the lower volume and revenue in all operating segments compared to same period last year due to slowdown of the local consumption and capitalization of assets and inventories which were not there in same period last year. Increase in finance charges further decreased the net profit despite slight increase in share of results from associate companies. Reasons of increase (decrease) for quarter compared with previous quarter The Gross profit is improved due to cost rationalization initiatives and major provisions were taken in last quarter previous year. Despite increase in share of results from associate companies, net profit is reduced due to positive one off item in other income of SR 6 million for disposal of Companys investment in Stork Saudi and reversal of old provision SAR 6.8 million in previous quarter which is not there in current quarter. Other notes Total revenue for the current quarter ending 31 March 2018 amounted to 117.9 million riyals compared to 171.9 million riyals for the same quarter last year, a decrease of 31% and with increase of 0.1% compared to previous quarter. Earnings per share reduced to SAR 0.01 compared to SAR 0.27 same quarter last year. Total shareholders equity (after minority interests) as at 31 March 2018 amounted to 1,068 million riyals, compared to 1,034 million riyals for the same quarter last year, an increase of 3.2% and with increase of 0.1% compared to previous quarter . Total Comprehensive income attributable to shareholders of parent company amounted to SAR 0.7 million compared to SAR 22.7 million in same quarter of 2017, a decrease of 97% and with a decrease of 84% compared to previous quarter. JEDDAH — The CEO of logistics services at LogiPoint, Hemanth Prakash said that the Saudi economic reforms have had a positive impact on the development of a significant logistical competition along the Red Sea coastline. This is bound to contribute in attracting local, regional and international investors and hence giving priority to the logistics of the Jeddah Islamic Port. He added that LogiPoint has served the largest and most important businesses in the Kingdom and the Gulf region for the past 17 years. He also stressed on the importance of providing high quality logistics services in Saudi ports, industrial areas and storage areas in remote regions. "Clients can dramatically improve costs and generate additional business by better controlling their supply chains with the help of simplified customs processes and technology-based integrated solutions," said Prakash. Prakash, emphasized on the importance of specialized logistics areas globally through economic zones in the Kingdom that can meet the needs of the entire industrial ecosystem and participate in the establishment of educational institutes, training facilities, research centers, suppliers and OEMs in the vicinity of one, safe environment. On the reflection of the Vision 2030 on logistics, Prakash said that the Kingdom is currently in a transitional period, which will reshape the way the Saudi economy works, especially since it aims to attract international investors in order to set forth a new beginning that would constitute a major transformation in the country. Furthermore, it will allow for a brighter future that meets international standards. Addendum announcement from Saudi Industrial Services Co. related to THE APPROVAL FROM THE SAUDI PORTS AUTHORITY FOR BERTH EXPANSION PROGRAM OF RED SEA GATEWAY TERMINAL CO.
Further to the announcement published on Tadawuls website on 24-02-2016 related to approval from the Saudi Ports Authority for berth expansion program of Red Sea Gateway Terminal Co. (of which SISCO effectively owns the 60.6% of the share capital)and further to the announcement published on Tadawuls website on 01-09-2016 about signing of the loan of SAR 260 million for that expansion; Saudi Industrial Services Co. (SISCO) would like to announce that the expansion works have been completed as scheduled and within the approved budget. The total berth length of the terminal after expansion is 1,355 meters equipped with 14 ship-to-shore quay cranes. The terminal can now handle three (3) mega vessels at the same time. The project also involved purchase of eight (8) new rubber-tire gantry (RTGs) cranes and twelve (12) new trucks/trailers to improve yard handling capability to facilitate faster customs clearance process. Due to expansion related capital expenditure, the amortization/depreciation expense for 2017 is expected to increase by approximately SAR 12 million. Financial impact in 2018 will be subject to local economic conditions. Saudi Industrial Services Co. (SISCO) has launched a campaign to clean Jeddah beaches on December 16, 2017. The company's managements realized the importance of the CSR programs involved in activating the Kingdom’s “2030 vision”, To preserve the sea environment, which is considered one of the most important economic resources. The CEO of the company Eng. 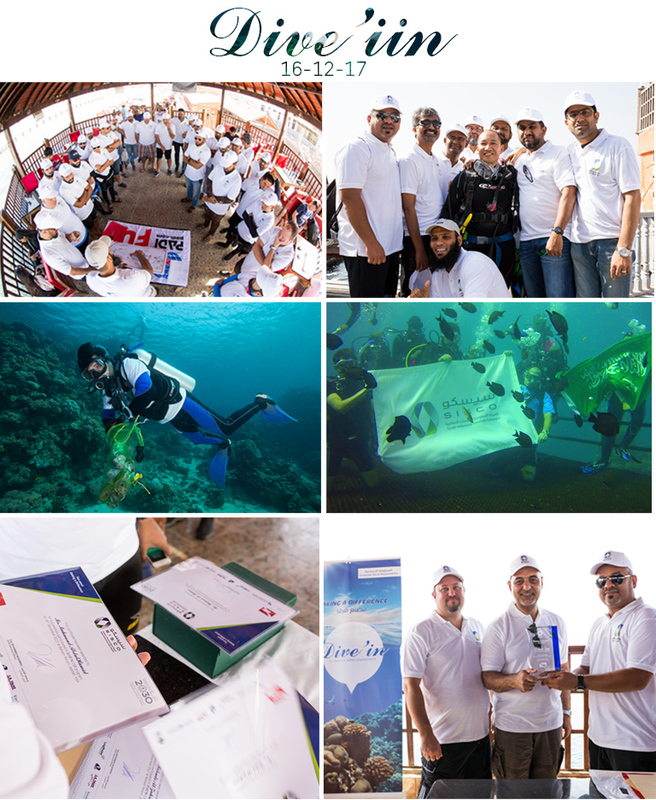 Mohammed Mudarres gave many thanks to SISCO Group`s employees and the volunteers who participated to the diving and waste extraction for their efforts to make this successful campaign.